Swimming is a life skill as well as great exercise and a challenging sport. Join us to swim laps, swim with your family or exercise with others who enjoy being in the water. We offer group and private swim lessons for all ages beginning at 6 months, competitive swimming and swim coaching in addtion to group aqua exercise. Our heated, indoor pools are open year-round for you to enjoy. Lifeguard on duty has final authority on all rules and safety regulations for the entire pool area. Any non-swimmer 10 years old or younger needs to be actively supervised, within an arm’s reach of an adult. No running, pushing, shoving, or rough play allowed in the pool or on the pool deck. No diving is allowed in the shallow end of the pool and in other areas where “NO DIVING” indicated. Intentional hyperventilation or extended breath holding activities are dangerous and prohibited. Persons having a contagious disease or open wounds are prohibited from using the pool. Do not swim if you are ill with diarrhea or have had diarrhea within the past two weeks. Diaper changing on the deck is prohibited. No food or beverages are allowed in the pool area; water must be in a plastic container. No glass items in the pool area. Proper swimming attire required in the pool. *See our YMCA Member Handbook for complete set of pool area rules. Wear family appropriate and clean swim attire only. No underwear, cut-offs, or dirty/sweaty attire allowed. See Swim Attire Description below. Diving is prohibited in water less than 5 feet deep. Please pay attention to markings on the pool deck. Spitting, spouting water from mouth or blowing the nose in the pool is prohibited. This includes no spitting or blowing water through water noodles. No extended breath-holding or hyperventilation activities are allowed. No inflatable items of any kind are allowed in the pool. This includes water wings and rings. The YMCA has been America’s leading swim instructor for more than 100 years. We’ve recently changed our swim lesson structure to simplify and more accurately describe skill levels. What is different? Lesson names are changing to stages that better reflect the skills learned and we’re moving away from the identifying fish levels. 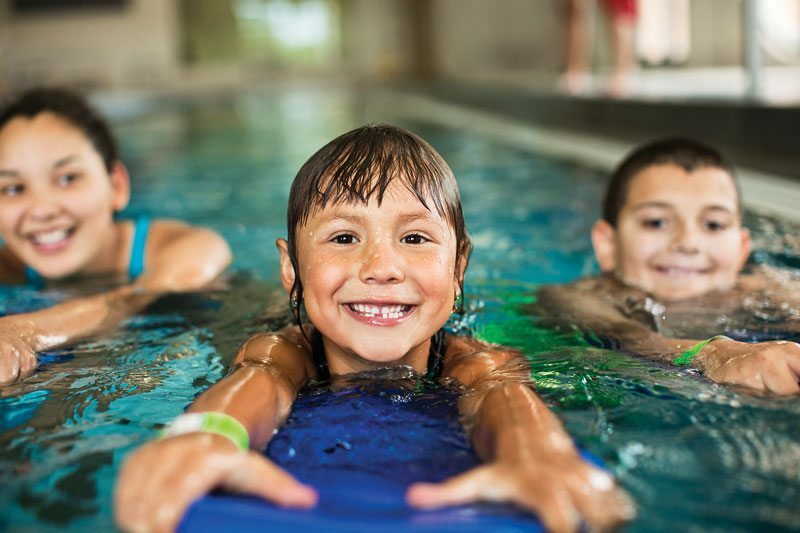 The aquatics director at your Y will help you determine which stage is appropriate for your children. Swimming lessons are essential for kids to become safe around water. It also helps them learn to set and achieve goals while keeping them active in a social setting. This is a great option for you if you love the water, are trying to get back in shape, having trouble with arthritis or simply want to switch up your workout routine. Each of the following branches offers water fitness classes Monday – Friday. All classes are free to YMCA members and all levels are welcome. For pool schedules, go to the schedule page for your branch and click on “Pool” under “Area” to see the classes for specific dates. Aqua Blast: Low-impact class focuses on muscle toning and cardiovascular conditioning. Aquacise Class: Designed for those who desire a little easier-paced workout. It will improve circulation, flexibility, and muscular strength. Deep Water: Cardio workout using buoyancy belts, with zero impact on your joints. This class uses simple movements and uses water as resistance. Early Bird Aqua: Medium intensity workout includes cardio, stretching, weights, aerobics. Stretch & Flex: Flexibility improves through various stretching techniques. Great for participants with Arthritis! Deep Water Exercise: Enjoy a total body workout with high resistance and zero impact! This class is for anyone looking for a good workout in the deep end of the swimming pool. Water Exercise: Increase muscle tone, flexibility, and range of motion. This is an excellent workout for those who need to exercise slowly and gently. It is also perfect for cardiac rehabilitation patients, arthritis sufferers and those recovering from surgery. Water Aerobics: Come have fun and get a great a great cardio workout to the rhythm of song. Low Intensity: Move at a slower rate, using water as resistance. Low Impact: Use minimum resistance to get a cardio workout that’s easy on the joints. Evening Aqua Fitness: Fun, low-impact routine with varied intensity levels. You don’t need to be an advanced swimmer to take part in our competitive swimming programs! We teach swimmers of all abilities competitive swimming skills like stroke development, time improvement and working together as a team while developing a healthy lifestyle. A seasonal YMCA Competitive Swim Team offering high quality professional coaching and technique instruction for all ages and abilities. Currently combined team with Marion Y swim team, with participants able to practice at both Marion and Helen G. Nassif pools. A competitive team that challenges athletes and ensures every athlete is treated the same. The team philosophy is “We swim because we have fun doing it?” Competitive swimming builds character, instills discipline, provides leadership, enhances self-esteem, promotes physical fitness and teaches teamwork.